Dio on Metal Maniacs Jan 2005 cover! The Metal Maniacs magazine has Dio on cover for their January 2005 issue! The magazine has a good interview with Ronnie, check it out! Mattias Ström promotes Master Of The Moon in Sweden! Black + Blue DVD out in Europe, Japanese release coming! The Black + Blue finally received a DVD release! It came out in Europe November 15th and US on November 23rd. The original DVD release a couple of years back got shelved at the last minute, but now it finally was released by Universal. There have been a number of different pirate DVDs from at least Brazil and Russia with varying quality, but now there's an official version available as well. In addition to the Black Sabbath and Blue Oyster Cult performances from 1980, the DVD has a new interview with Ronnie James Dio, bio and discographies of the featured bands as well as reproduction of the original movie poster. The original live footage was produced by no-one else than the former Beatle George Harrison! In Japan it will come out on December 22nd, 2004. It is currently unknown if the Japanese release will have any extra material compared to the European or the US release. Ronnie's first LP, "Dio At Domino's" from 1963 by Ronnie Dio And The Prophets was recently auctioned on Ebay. Depending on the source, 300, 500 or 1000 copies of it were manufactured over 41 years ago - most likely the correct figure is 500 copies. This rarity was sold for over $360 to a US collector. Still no official word about the Japanese release date, but some rumors suggest early spring. It remains unknown on which label the CD will be released, but it should contain a bonus track titled "Prisoner In Paradise". Something about the Master Of The Moon tour plans for the year 2005: According to Ronnie, the band is planning to do a few gigs in Russia around March and perhaps even before that, do another US tour. Some rumors are floating about Dio, Judas Priest and King Diamond package tour, but those seem to be just one of these rumors the Internet is full of these days. Europe will get to see Dio in the summer. One new gig has already been confirmed - Dio will appear for the third time at the Sweden Rock Festival in Sölvesborg, located in Southern Sweden. The festival will span over three days, June 9-11th, but it still remains to be seen which day Dio will play. The Metal Exiles published an interview with Ronnie on November 20th. Click here to read it! Craig Goldy, along with a long list of other musicians, is going to appear at the eigth Rock 4 X-MAS event, this year held at The Kings Club in Long Island, NY on December 4th from 1pm to 1am! The aim is to raise money for the Nassau, Suffolk coalition for the Homeless & Fire / Rescue Widows and Children fund of Long Island. More information is available on the project's web pages here. The Hollywood Allstarz are going to Hawaii in December. Their line-up consists of bassist Jeff Pilson, vocalist Chas West, drummers Vinny Appice and Alan Krigger as well as guitarist Carlos Cavazo. Four gigs in Hawaii have been announced: December 3rd, 4th and 5th at The Wave in Waikiki and December 11th at Kona Brew Club in Kona. Master Of The Moon US tour is now over. The band is still going to do one gig this year - Monterrey Metal Festival in Monterrey, Mexico on November 13th. The touring plans for next year are still mostly open, only one gig for the next summer is confirmed by far. However, I'm sure we will get more than one date from Dio next year! Sweden Rock Magazine features Dio! From Tuska Metal Festival in Helsinki, Finland: Marko Syrjala of Metal-Rules.com interviewed Rudy Sarzo about past, present and future. Read it here! Glam-Metal.com interviewed Rudy as well. The interview is available on their web site. Dio live from San Francisco! October 29th, 2004 gig was broadcasted live on San Francisco's "107.7 The Bone" and on the Internet at http://www.1077thebone.com/. Dio will apparently be live again at 7pm PST *tonight*, i.e. October 30th, 2004. Dio has been the "Classic Rock Artist" of the week on the station, too. Ronnie was recently interviewed by Garry Sharpe-Young, author of the excellent "Never Say Die" Black Sabbath book, at Rock Detector. Read the lenghty interview http://www.rockdetector.com/artist,2586,interviews.sm#contenttop">here! WWIII with Vinny Appice on drums, Jimmy Bain on bass, Moni Scaria on guitar and Mandy Lion on vocals will do a gig at Vinnie's Bar (probably not Appice's, though) in Bakersfield, CA. Incidentally this is the town where Vinny Appice decided to call it quits with Dio in the start of the Inferno tour in May 1998, although he still played in Dio at a couple of gigs after the Bakersfield show. There should be an article in November 2004 issue of the Aardschok magazine - available only in Dutch, though. Ronnie is interviewed in the current edition of the British Classic Rock magazine. Apparently he discusses his ex band members there, including Jimmy Bain, Cozy Powell and Ritchie Blackmore. Alice Cooper interviewed Ronnie in his radio show titled as "Nights with Alice Cooper." The interview is available on Alice's site at address http://www.nightswithalicecooper.com/listen.asp. One more Ronnie interview this month: All Access Magazine interviewed Ronnie and the interview can be read here! Viv has given a number of interviews recently where he slags Ronnie from left and right. One of those interviews can be found here - this one is already a year old, though. October 17th, 2004: New Dio interview - Master Of The Moon on vinyl, VH1 Classic interview, Halloween shirts, Dio returns to Mexico, new DVD in works! Electric Basement published a Dio interview a while ago. Read it in this location! Master Of The Moon on vinyl! 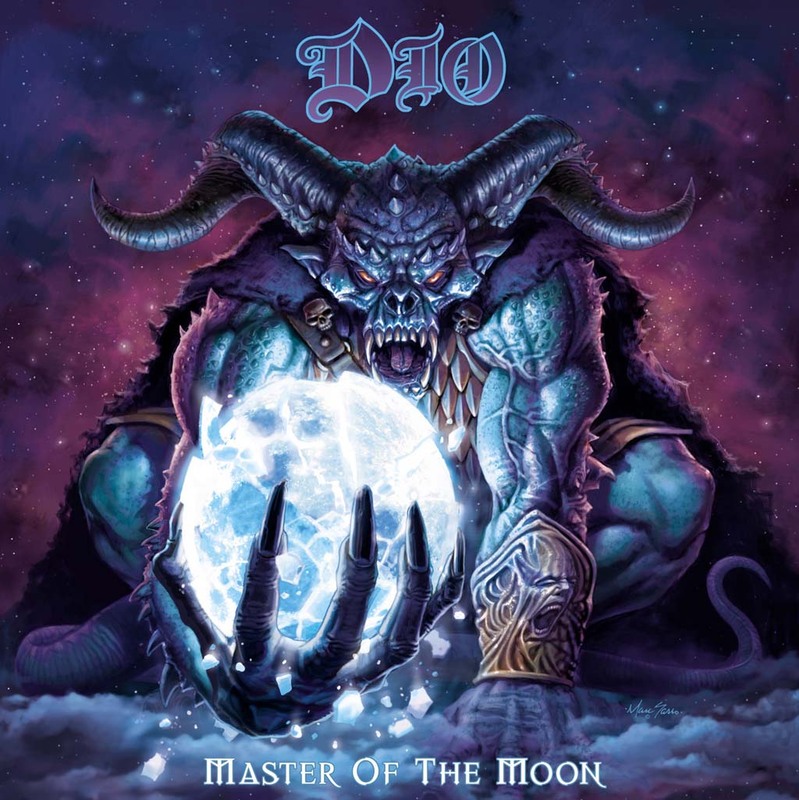 SPV in Europe did a wonderful thing to the Dio record collectors: Master Of The Moon has been released on both black vinyl LP as well as a picture disc LP! These were already released on Septeber 13th. I'll post a short review how these look and sound when I get them! Ronnie was interviewed on VH1 Classic's Metal Mania show throughout the 2 hour show last night! Sorry again for too late notice, I didn't manage to update my pages before the show was already done. Dio will have some special halloween shirts for sale at the California Master Of The Moon shows in Anaheim, San Francisco and Los Angeles! Those are very limited offer shirts, so get them if you are able to go to those shows! Dio, Twisted Sister, Dokken, Quiet Riot and Shaman will play at the 1st Monterrey Metal Fest at Auditorio Coca Cola in Monterrey, Mexico on November 13th! Unfortunately the Las Vegas, NV gig on October 31st will not take place. According to the rumors, the promotors were not able to find a suitable venue for the show as it is the halloween weekend and all the venues were already booked. Rhino is working on a new Dio DVD, set for the release in mid 2005! It will feature all the Warner Bros' Dio promo videos as well as interview with Ronnie talking about each of the videos on the DVD! September 30th, 2004: Black + Blue on DVD? - Hardradio interviews Ronnie - Dio on SNR on XM Radio - Dio to tour with Dokken? Black + Blue finally going to be released on DVD? The rumors say that Universal is planning to release the long, long awaited DVD of "Black + Blue" - live show from the 1980 Black Sabbath and Blue Oyster Cult US tour. Some online record stores list this being released on November 15th, 2004 with the catalog number UNI-982339-6. In 2002, Castle Communications tried to release this on DVD and also filmed an interview with Ronnie as a bonus for it, but the release was then cancelled at the very last minute. There are numerous different bootleg/counterfeit DVD releases of the Black + Blue out there, but at least until now there aren't any official ones. In mid November we'll see if Universal really comes out with this! Hardradio interviewed Ronnie a while ago - read the interview on their pages. Dio will join SNR on XM Radio on October 2nd after their show at Beacon Theater in New York. The radio show starts already at 8pm eastern, and is extended until 1am. Those who can receive this channel - tune in! Dio's warm-up band Fireball Ministry and perhaps also Anthrax will be on the air too. Dio to tour with Dokken? In one interview Ronnie mentioned that they might team up with Dokken for a tour - those tour dates have not been yet published, but might take place in November. Currently this is just speculation, lets wait for the dates show up..
Several new dates for the US tour have been confirmed for Texas, New Mexico, Arizona, California and Nevada! Check them out on the Master Of The Moon tour date page! The Argentinian Black Sabbath tribute CD is now released! I got a promo copy of it for review - so here it comes: The CD comes in a regular jewel case, wrapped in a cardboard slip case - cool looking packaging for sure! The album consists of 10 Sabbath covers from different South American bands from just about all the Sabbath major line-ups. From Dio years there are three tracks, Heaven And Hell, TV Crimes and Die Young. Most of the songs are quite faithful to the originals. I'm probably not qualified to rate non-Dio tracks, but still, especially Los Natas' version of Paranoid certainly belongs to the "good Paranoid covers" list in my books. It was also very good to hear some non-Ozzy covers, such as Anno Mundi and especially No Stranger To Love, which is sung by Glenn Hughes together with the band Rata Blanca. Heaven And Hell is certainly the most interesting tune for me on this album: it is sung in Spanish! The singer has certainly excellent voice and their version of Heaven And Hell is superb! Good choice to do it in different language than the original - while I don't speak Spanish at all, it still made quite an impression to me. TV Crimes is done in much faster style than the original. The vocal style is also quite different, much rawer and perhaps not as much to my taste as most of the other tracks. Die Young also has quite different vocal styles but on the other hand, the list of vocalists on the track is quite extensive too. The album is available from Blackstar C. Productions in Argentina. Check out their web site at address http://www.blackstar3.com/! Classic Rock Revisited published a few days ago an excellent interview with Ronnie James Dio! You can read it at Classic Rock Revisited's site. Ronnie's planning to do a new charity album, hopefully in early 2005. The album will have one song with several other artists than just Dio and the rest of the tracks will have some previously unreleased tracks from the bands involved in the project. This time the proceedings will go to the Children Of The Night organization. The original Hear 'N Aid album is also planned to be released on CD and the video on DVD. The album has been released on CD only in Japan this far. 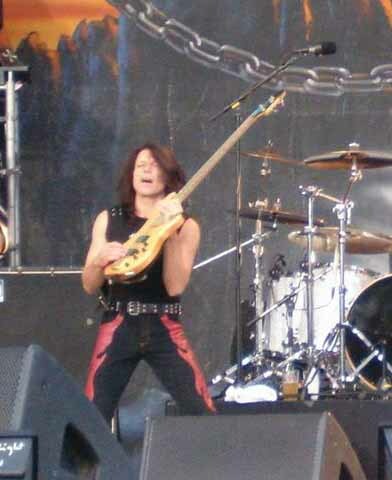 Dio's current bassist Rudy Sarzo will appear on the forthcoming Michael Angelo Batio CD. The other musicians will consist of Michael Angelo Batio, Bobby Rock, Mark Tremonti, Jim Gillette, Doug Marks and Bill Peck as well as some still unnamed musicians. For more information, check out their own pages by clicking here. Ex Elf member and Ronnie's cousin David "Rock" Feinstein's band Feinstein is working on their 1st music video for the song Regeneration. The video will have footage from Feinstein's gig at Wacken festival in Germany in August as well as some studio footage. Sorry for too late notice, but I didn't get a hint about this in advance. Ronnie called in on Eddie Trunk's Friday Night Show on September 17th. The interview might turn up at KNAC's site later on. Ronnie will be featured on Dee Snider's House Of Hair show #363 - so if you get House Of Hair on your radio station over there in the US, check out that show. Unfortunately I don't have the exact dates when this will go out..
Master Of The Moon tour date page has new dates and some corrections for the US tour! In addition to the shows listed there, rumors say that Dio will play San Francisco & Los Angeles, CA and Las Vegas, NV on the Halloween weekend. Those are not confirmed and venues are not known yet, but they might take place around that time. Check out the Master Of The Moon tour date page for the updated tour date listing! Philadelphia, PA, Clearlake, IA and Orlando, FL shows added. Most of the dates are still pending - I'll update my pages as soon as I get any of those! It looks like I was too hasty when I put up Clifton Park, NY show on Septeber 28th in the tour date listings - that particular gig seems to be Anthrax only show. Also Motorhead has cancelled their whole US tour because Lemmy hurt his leg in Europe, so they will not appear on October 1st in Worcester, MA. Garry Sharpe-Young, who already wrote excellent book on Sabbath a while ago, is now busy with another Sabbath related book. This time he'll go through the whole history of Sabbath recordings - so the book will certainly be very interesting to read to any Black Sabbath collector (I'm already anxiously waiting for it myself!). The book should be out late next year, but no exact date has been yet set. The book will be released by Rockdetector.com. September 5th, 2004: Master Of The Moon tour and album news, reviews, polls, We Rock 2CD European compilation out! Master Of The Moon US tour will feature Fireball Ministry (http://www.fireballministry.com/ as the opening act throughout the tour. Anthrax (http://www.anthrax.com/ will be the middle band for the first three weeks of the tour - the first part of the tour, that is. The 2nd and 3rd part of the tour will have different middle band according to the reports. As of today, 7 shows have been confirmed, but many more are coming for sure! The tour starts in late September, currently the first announced date is September 28th in Clifton Park, NY. There were plans to start the tour in Detroit on September 23rd, but now the Detroit, MI gig has been set to October 8th instead. Master Of The Moon in charts! Master Of The Moon debuted in the Finnish album charts at #16! If you count out the Finnish bands from the chart, Dio'd be #5 there ;). If my memory serves, this is the highest position for Dio ever since 1987's Dream Evil! Dio is also well represented in Sweden: One of the biggest, if not the biggest record store there, Ginza (http://www.ginza.se/) lists Master Of The Moon as the 3rd best selling album at the moment, and the new European 2CD compilation "We Rock" as the 5th! The Canadians will get the Master Of The Moon a week later than the US - September 14th has now been set as the release date in Canada. We Rock - Greatest Hits was released at the end of August (25th to be exact) by Dio's old European record company - possibly to coincide the Master Of The Moon release date. The 2CD set contains material from Elf to Dio until the Killing The Dragon album. At Wacken festival approximately month ago, Joey DeMaio of Manowar handed Ronnie on stage an award to honor Ronnie's lifetime achievements! 20 000 people cheered when this took place and Ronnie was certainly moved as well! The new album hit the stores in Greece on August 27th - same goes for Holland too! Tomorrow it should be out throughout the Europe! I'm pretty sure my very good friend Genady of Angen.net (hosting company for http://www.dio.net/! )will go here: Dio, Motorhead, Anthrax and Fireball Ministry will play The Palladium in Worcester, MA on October 1st! Dio will headline the show in case you were wondering. August 25th, 2004: Master Of The Moon out in Finland, some reviews too! Master Of The Moon was released today in Finland! I was very surprised when I got a call from my friend who saw that the record store shelves were full of the new CD this morning - it looks like the SPV was five days early here in Finland compared to the rest of the world! I wrote a review of Master Of The Moon a few days ago, click here to read it! Electric Basement also published excellent review of this on their pages. Click here to read their review! General comment about Master Of The Moon reviews: The more I read them, the more I get the feeling that if the guy or girl behind the review has listened thru the album more than once or twice, the more he or she has liked it. This is certainly one of those albums of which you cannot get the full grasp after just one listening. Too many things there on the album for that, you need to listen to it! It looks like the Master Of The Moon release date in the US has been pushed to September 7th instead of August 31st. Reason for this has not been given - but the European release should be coming out as planned on August 30th! The Japanese release date for the CD has not been set yet. There were some rumors about the US release date being pushed back two weeks to September 14th, but those are not correct. I'll post my review of Master Of The Moon album here shortly, as soon as I finish typing it in. Before that, I can post this ... slightly condensed review: The new album ROCKS! The more I listen to the promo copy, the more I love it - this album certainly gets better and better over the time! Alex Skolnick Trio is going to release their newest album Transformation on September 14th. Half of the album will be their own material, half of them covers - including Dio's classic from 1983, Don't Talk To Strangers. This will be ... lets say interesting ... since the band is certainly not your average heavy metal band, instead they're playing jazz! For more information, click here to jump to their home page. Blackstar has now released their South American Black Sabbath tribute CD, titled "Sabbath Crosses: Tribute To Black Sabbath! I'll post a review of it here as soon as I get it, but you can already check out the record company's web site at address http://www.blackstar3.com/. Something very rare happened as the European tour came to the end: The last show - Rock City in Nottingham - in the UK was cancelled. The reason to the cancellation was very simple: The venue turned out to be closed for repair work! Based on what I've heard elsewhere, those repairs had been long overdue already... The band tried to find a suitable venue in Nottingham and nearby areas for the night but nothing suitable was available at this late minute. Dio has cancelled shows *VERY* rarely. Just a handful of shows have been postponed because of illness. In addition to that I'm aware of only one show in Italy that has been cancelled (and it also because of the promotor, not the band) - this applies to the whole 21 years of Dio the band history! Of course there have been some rumored or initially planned shows too, but nothing confirmed. According to Sanctuary Records, Dio's US record company, we'll soon have a line of Dio toys. No word is out who will be featured, but at least I'm fairly sure the characters will certainly include Ronnie himself showing the evil eye sign - and perhaps also Murray? The release date has not been set yet. The original Rods lineup was meant to have a reunion show at Wacken metal festival in Germany a couple of weeks ago but reports from the festival say that the original drummer Carl Canedy was not there. Instead there was Rhino on drums - some may or may not know him from Manowar. WWIII announced that their original lineup will play their first gig together for over ten years. The show will take place at Paladinos in Tarzana, CA on September 18th. The band will consist of Jimmy Bain on bass, Vinny Appice on drums, Mandy Lion on vocals and Moni Scaria on guitars. Rudy's bass guitars were stolen during the tour in Valencia, Spain on July 27th! Someone broke into the tour bus and stole them. If you have any hints who stole those or where those could be found, please contact me as quickly as possible! You can send me e-mail anonymously using any of those free e-mail services available if you wish. My e-mail address is dio@iki.fi. Pictures of Rudy playing those guitars a few weeks earlier in Helsinki, Finland can be found here: 1st bass (picture by Matti Dahlbom) and 2nd bass (picture by Toni Poikonen). Master Of The Moon samples! SPV, Dio's European label, has posted samples from the forthcoming album on their web site! Click here to hear them! More South American dates have been revealed - Dio will play Buenos Aires in Argentina on August 25th! Also, a bit more in the future, Dio will headline the 10th anniversary of the Bang Your Head!!! Festival in Balingen, Germany next summer! Click here for a review of Dio's Master Of The Moon! July 26th, 2004: Master Of The Moon Updates, Rainbow DVD, Bob Daisley, Riverdogs, Jeff Pilson, Hear 'N Aid, Vinny Appice, Jimmy Bain, Ronnie and Tony Iommi as well as Feinstein - lots of news this time! Master Of The Moon promos out! Master Of The Moon promo copies are out at least in the Europe! Check the online sources and magazines for reviews - I haven't seen any of those yet, but I'm sure those start to appear Very Soon Now! Master Of The Moon CD - Advance Orders! Online record stores, such as http://www.amazon.com/ and http://www.cduniverse.com/ are taking preorders of Master Of The Moon CD - which is to be released on August 30th in Europe and August 31st in the USA! The Japanese release date has not been published yet - but a rumor has leaked out that the Japanese CD will have a bonus track this time again! A couple of dates for Central and South America have been confirmed! Mexico City on August 21st, Santiago in Chile on August 24th, Rio De Janeiro on August 27th and Sao Paulo on August 28th! Tickets are already for sale, be quick or they will be sold out! The band is currently touring in Europe and the response everywhere has been overwhelming! The set list has been classified by many as one of the greatest Dio set lists ever, containing some rare surprises not heard for ages! 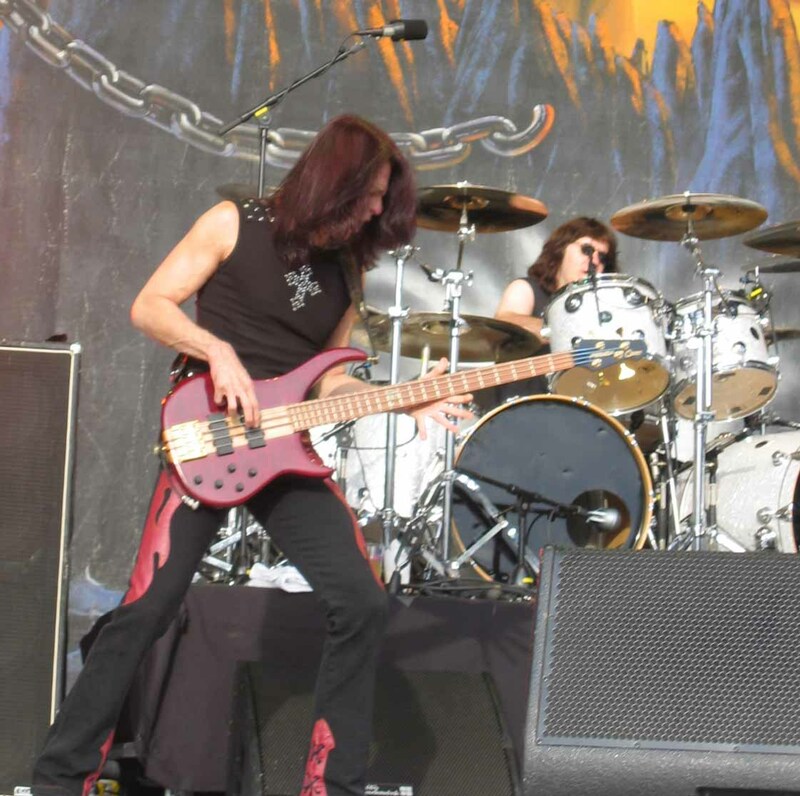 Dio's bassist Rudy Sarzo has planned to start a tour diary on his web site at address http://www.rudysarzo.com/ - at the time of writing this on July 26, there is nothing yet but supposedly within the next few days the situation should change! Classic Rock Productions is doing a huge favor to the Rainbow fans! They're going to release a DVD titled "Inside Rainbow 1975-1979" containing extensive live footage of Ronnie James Dio fronted Rainbow, as well as interview with Doogie White, Rainbow's vocalist from the 1990s. The DVD should also contain fan and crew interviews. You can order the DVD directly from Classic Rock Productions at this address: http://www.classicrockproductions.com/2004/insidethemusic/newinsidethemusic/rainbowdvd.html. The former Rainbow and Dio bassist (for short tour a few years ago!) Bob Daisley has formed a new band called Living Loud, together with guitarist Steve Morse (Deep Purple, Dixie Dregs, Kansas), keyboardist Don Airey (Deep Purple, Rainbow), drummer Lee Kerslake (Uriah Heep, Ozzy Osbourne) and vocalist Jimmy Barnes (Cold Chisel. The band is going to release their self-titled debut album in August or September through EMI Records worldwide. The album was originally going to be called Relentless, but it was changed to "Living Loud" instead. The album will have five original Living Loud songs and numerous Ozzy Osbourne cover songs. The band is also going to release a DVD at the same time. Viv's band Riverdogs is currently recording a new album and have already finished six songs. The band is also going to do a couple of gigs in Los Angeles, CA and San Diego, CA around the end of August as mentioned on this page already a couple of weeks ago. Jeff Pilson recently gave an interview to Electric Basement, discussing the forthcoming Dio album as well as numerous other topics. Click here to read the interview. Jeff Pilson played yesterday (July 25th) one-off gig with Foreigner at Fess Parkers Doubletree Resort in Santa Barbara, CA. Jeff states Foreigner was a huge influence on him for both singing and songwriting. ReddKross.com is hosting the video "Hear 'N Aid: The Sessions" online - click here to view it (you need Quicktime on your computer to be able to watch this video). Vinny Appice and Jimmy Bain have now rejoined WWIII with the original singer and founder Mandy Lion and guitarist Moni Scaria. Gigs are apparently being scheduled for late summer. Vinny Appice will also play with keyboardist Erik Norlander of Lana Lane and Rocket Scientists at a couple of gigs on the East Coast of the US. Kelly Keeling (Michael Schenker Group, Guitar Zeus and George Lynch to name a few) will be singing and John Covach will play the guitar. Lana Lane is also said to be on vocals. In a recent interview (read it here) Ronnie mentioned that he would consider working with Tony Iommi. Since the interview was published a couple of weeks ago, I've received numerous e-mails asking whether Ronnie is now rejoining Black Sabbath or doing some solo project with Tony Iommi. The answer is NO - Ronnie just said that he would consider it IF such offer should arise. Dave "Rock" Feinstein's band Feinstein will play one-off show at The Haunt in Ithaca, NY on July 30th. Master Of The Moon artwork and release date revealed! Master Of The Moon artwork has been revealed. Click here to see the front cover picture, done by Marc Sasso! The US release date has been confirmed. As it is with most US releases, the release is one day after the European one, i.e. August 31st, 2004! Ronnie was recently interviewed by Electric Basement! Click here to read the interview! July 10th, 2004: HAPPY BIRTHDAY RONNIE! Ronnie celebrates his birthday today, possibly preparing for the European tour starting in just a couple of days! Happy birthday Ronnie, enjoy your special day! Master Of The Moon will be released in Europe by SPV on August 30th, 2004! The US release date has not been confirmed yet, but it is almost certainly very close to the European release date. The North American tour is now expected to kick off on September 23rd in Detroit, MI - the start of the tour has been pushed back a bit because of the delays with the album release. SPOILER ALERT: The European fans will hear one track off the album in advance! This is a very special treat - Dio has done this only in 1983 when they played Evil Eyes at some gigs! The track this summer will be The Eyes - interesting coincidence with the name! The song "The Man Who Would Be King" was originally thought as a fantasy song, but Ronnie changed it so that it applies to the USA-Iraq war instead. It is not to be taken literally, though, more like metaphorically. The cover art for Master Of The Moon will be painted by Marc Sasso, the artist who also painted Killing The Dragon! Only one artist, Wil Rees, has done two Dio album covers previously - he did Lock Up The Wolves and Strange Highways, as well as Black Sabbath's Dehumanizer. Master Of The Moon artwork has not yet been revealed, but it will not feature Murray. We Rock - Greatest Hits is going to be the title of the forthcoming Dio best-of CD - or most likely double CD set. This will come out on Universal Records in Europe, UNI-982 040-4 will be the catalog number. The release date has been set to August 25th, 2004 - five days before the newest studio album Master Of The Moon will appear in the stores. Quite extensive song selection, including one Elf song, five from Rainbow, four from Black Sabbath and 18 from Dio. Blackstar label (http://www.blackstar3.com/)in Argentina is going to release a Black Sabbath tribute CD by the end of July, titled "Sabbath Crosses: Tribute To Black Sabbath". The record label owner Fernando Serani is a long time Black Sabbath fan and used to ran Black Sabbath oriented magazine called "Sabbath Crosses." The album will have one ex Black Sabbath member on "No Stranger To Love - Glenn Hughes, who will play bass and sing the song with the band called Rata Blanca. All the bands appearing on the tribute CD are gold and platinum selling heavy metal bands from South America. Electric Basement interviewed David "Rock" Feinstein - Ronnie's cousin and ex Elf guitarist. The interview can be read here: http://www.electricbasement.com/absolutenm/anmviewer.asp?a=78&z=10. Live Evil on 180 gram vinyl! For us Ronnie James Dio record collectors the Italian Earmark label gave a great present for this summer: They reissued Black Sabbath's Live Evil double album on high quality, 180 gram vinyls! The sleeves are made of thick cardboard and the sound quality is excellent! This is the first time since 1993's Strange Highways when Ronnie James Dio related album has been released on vinyl! It looks like it takes (at least) three times for me to post these updates to get them finally complete and correct. In addition of Hear 'N Aid, Evil Eye and the Tenacious Dio, Ronnie James Dio was also featured on the second position on VH1's list: Tony Iommi's guitar sound with Black Sabbath. This connects all the top three positions to Ronnie James Dio! Ronnie gave VH1 an interview where he praised Tony's playing, telling how Tony Iommi invented the "metal" sound.